Wangan Midnight Maximum Tune 3DX Plus is an updated version of Namco's arcade racing machine with additional cars, a new track, and extra customization options. The new cars available in this version are the GT-R (R35) and Skyline GT-R (KPGC10), and the new course added to this version is the Fukuoka Urban Expressway. The game also features new dress-up parts, making it possible to customize your car in any way you like. And this update version sees the return of both VS Battle and Ghost Versus modes. Players can choose between three main characters to play: - Akio Asakura - an ambitious racer who started young - Reina Akikawa - a very attractive model who co-hosts a driving television show named 'Drive Go Go! ', and... - Tatsuya Shima - Akio's main rival and a skilled surgeon who uses his large salary to fund his Porsche. This version is part of the Wangan Midnight Maximum Tune franchise, which includes several other arcade driving versions of the game, manga, television series and a movie. This highly popular arcade series is well known around the world and with a number of card and online features, encourages a high continued play and replay value. The new cars available in this version are the GT-R (R35) and Skyline GT-R (KPGC10), and the new course added to this version is the Fukuoka Urban Expressway. The game also features new dress-up parts, making it possible to customize your car in any way you like. And this update version sees the return of both VS Battle and Ghost Versus modes. Tatsuya Shima - Akio's main rival and a skilled surgeon who uses his large salary to fund his Porsche. 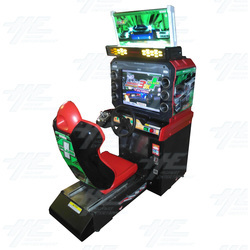 This version is part of the Wangan Midnight Maximum Tune franchise, which includes several other arcade driving versions of the game, manga, television series and a movie. This highly popular arcade series is well known around the world and with a number of card and online features, encourages a high continued play and replay value.